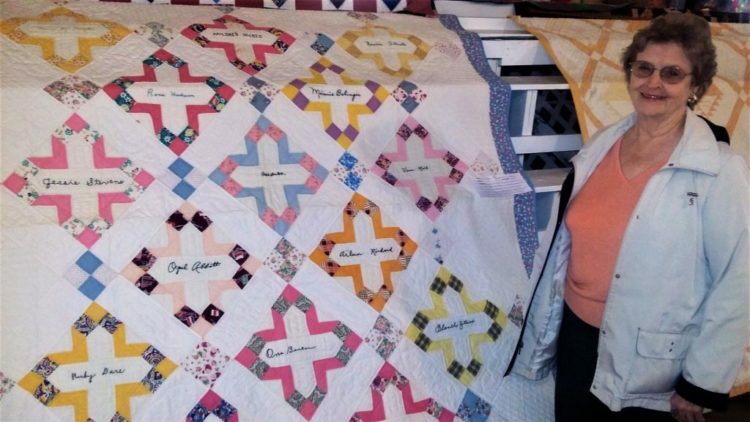 The quilt show at Pioneer Harvest Fiesta is one event for women at the annual show. Pictured is Charlotte Hite, Fort Scott, who brought several heirloom quilts to the show. This quilt is one of her grandmother’s, who was in a quilting club in Uniontown. Other events: arts and crafts show, gas engine exhibit, tractor exhibit, flea market, food vendors and live music. Wheat threshing, draft horse plowing, corn husking, rock crushing, sawmill operation, are among the demonstrations at the event. Because of wet arena conditions, there will be no tractor pulls, according to Allen Warren, of the PHF board.